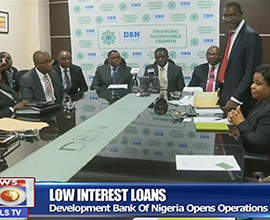 The Development Bank of Nigeria (DBN) was conceived by the Federal Government of Nigeria (FGN) in collaboration with global development partners to address the major financing challenges facing Micro, Small and Medium Scale Enterprises (MSMEs) in Nigeria. Our objective is to alleviate financing constraints faced by MSMEs and small Corporates in Nigeria through the provision of financing and partial credit guarantees to eligible financial intermediaries on a market-conforming and fully financially sustainable basis. Because our mandate fully supports the stimulation of diversified and inclusive growth, DBN will contribute to alleviating specific financing constraints that hamper the growth of domestic production and commerce by providing targeted wholesale funding to fill identified enterprise financing gaps in the MSME segment. MSMEs are, collectively, the largest employers in many low-income countries including Nigeria, yet their viability is being threatened by lack of access to risk-management tools such as savings, insurance and credit. Indeed, their growth is often stifled by restricted access to credit, equity and payments services. "In Nigeria, there are over 37 million MSMEs contributing to over 50% of Nigeria’s GDP. However, less than 5% of these businesses have access to credit in the financial system." MSMEs in Nigeria play a crucial role in economic growth, poverty reduction, employment creation, and shared wealth creation. DBN will play a focal and catalytic role in providing funding and risk-sharing facilities. It will also incentivise financial institutions, predominantly Deposit-Money and Microfinance Banks, by augmenting their capacity and by providing them with funding facilities designed to meet the needs of these smaller clients.